The 2016 season marked the Falcons last season at the Georgia Dome, before moving into Mercedes-Benz Stadium in 2017. 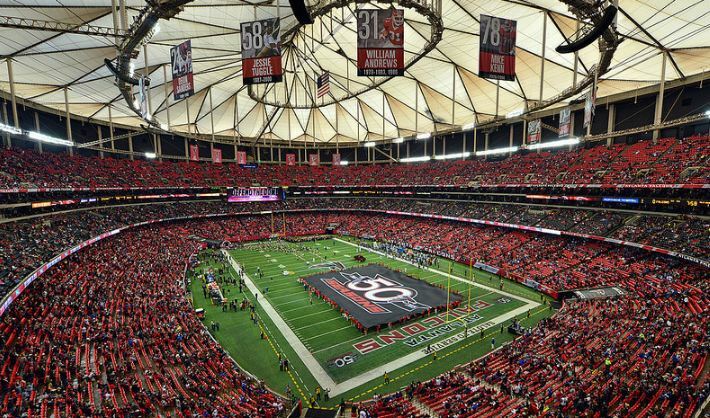 For 24 seasons the Atlanta Falcons played in downtown Atlanta at the Georgia Dome. The history of the Falcons began in 1966 at the newly constructed Atlanta Fulton County Stadium, a multipurpose stadium that was also home of the Atlanta Braves (MLB). As early as November 1983, owner of the Falcons, Rankin Smith, wanted a new stadium for the Falcons. Two years later Atlanta businessmen joined efforts with city and county officials to obtain funding for a new stadium. Discussions were slow, with some officials suggesting that Atlanta Fulton County Stadium be renovated. Smith viewed this plan as unacceptable and threatened to move the Falcons to Jacksonville. By 1988, talks intensified about building a new stadium, and in 1989, approval finally came from the state, Atlanta City Council and Fulton County Commission to build a domed stadium. 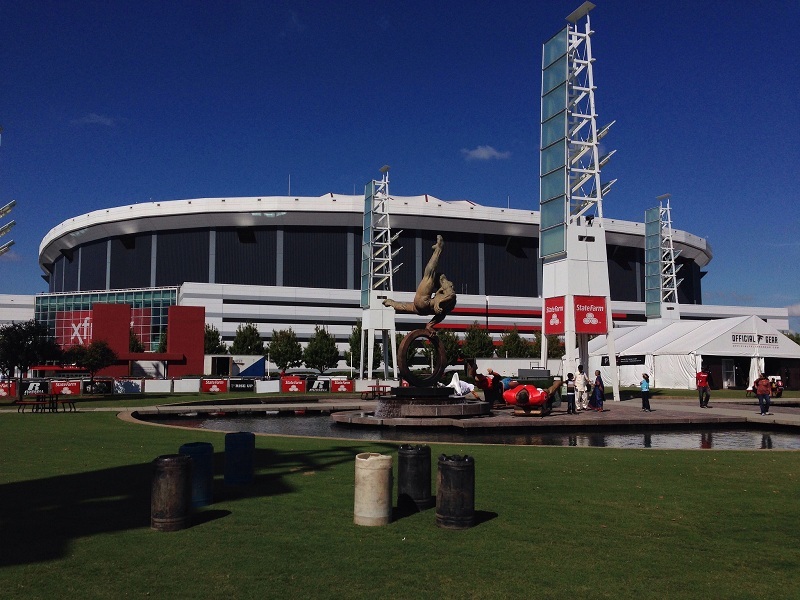 Ground breaking ceremonies occurred on November 22, 1989 and the Georgia Dome was completed by the start of the 1992 NFL season. The Falcons played their first game at the Georgia Dome on September 6, 1992 when over 70,000 fans filled the stadium. Three tiers of seats circled the gridiron. The domed roof consisted of Teflon and fiberglass and was the worlds largest cable supported stadium. The Georgia Dome had many amenities including over 4,600 club seats and 164 luxury suites. After the 2002 season the surface of the Georgia Dome was changed from Astroturf to Fieldturf. In 2006, a $30 million renovation plan was approved to upgrade the Georgia Dome. Luxuries areas were updated, eight new super-suites were created and new LED ribbon-boards were installed. Before the 2008 season all of the original teal seats were replaced with new red and black seats, the facade was repainted, concourses were upgraded and new High-Definition videoboards were installed. The Georgia Dome has hosted Super Bowls XXXIV in 1994 and XXVIII in 2000. It also hosted several Olympic events in 1996, was the home of the Atlanta Hawks (NBA) during the 1998-’99 season, and hosted the NCAA Men’s Final Four in 2002, 2007 and 2013. Each year the Georgia Dome is home to the SEC Football Championship and the Peach Bowl college football game. In 2011 the Falcons announced plans that they would begin exploring the option of building a new stadium. The team wanted a new stadium because they believed the Georgia Dome lacked premium seating and other amenities found in recently built NFL stadiums. In December 2012 the Georgia World Congress Center Authority (GWCCA) board approved terms for a new stadium. Named Mercedes-Benz Stadium, it opened in September 2017. All events held at the Georgia Dome moved to the new stadium and the Georgia Dome will be imploded in November 2017. On January 22, 2017 the Falcons played their final game at the Georgia Dome, a NFC Championship victory over the Pittsburgh Steelers. The Georgia Dome was imploded on November 20, 2017.